Wondering if anyone has cycads in their gardens, tips on how they successfully grew them and care instructions please. I have 4 propagated from cones and they did, as promised, throw up 5-6 leaves while in their pots. We planted out onto mounds roughly 30cm high for good drainage, but they dont appear to be growing anymore and the spines of the leaves are going yellow while the rest of the leaf is still nice dark green. Any help would be greatly appreciated in advance. Not sure where you are living - but I have found my cycads on the Central Coast do not like wet feet so don"t water them thinking they are thirsty. It is wise to have planted them on a mound. Also, don"t give up on them too easily. Just leave them be and they often recover all on their own and suddenly spout new growth. They have lots of energy (food) in their root base. I have, very occasionally, given my sick ones some liquid seaweed fertiliser. After two years one I unsuccessfully (I thought) transplanted sprouted and it is now a stunning specimen. Remember to wear gloves when handling the seeds as they are poisonous.Good luck. Thanks Beth! Yes they are sitting on top of the mounds so will never have wet feet. I do believe they do like to be kept "moist" though? No, John, in my experience you will need to research which type of cycad you are dealing with. I watered a Mexican (I think) cardboard palm(cycad) because I thought it had suffered heat stroke. Alas, I later learnt that they grow in the desert and need very little water. 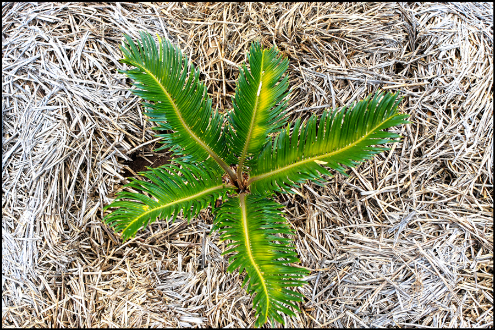 Some Northern Queensland cycads may like a drinkbest to research your variety. Hi Beth, thanks. I have no idea what variety they are but they are doing well now and look to be settled in to their new position. Just very slow growing now but the earlier growth to the stage shown in the photo above was only a couple months. They have hardly grown any thing since but the light green/yellowing has gone (mostly). We are located on the western fall of the great dividing range about 60kms south of Tamworth so we get quite hot summers and frosts in winter. Im now confident that the cycads wont get wet feet and I only water them now after a spell of extra hot weather or at least every 10 days or so. The drainage is good. Our water is not very good (bore and very brackish) and when it does rain you can see a massive transformaton in the garden. Hence, I have a water tank off the shed to use every now and then between bore waterings in the dry spells. Anyhoo.nice of you to reply Beth and Im enjoying this forum and blog. Its a good resource.